I have to buy a new pomade as my current one is almost used up (PAA Atomic Bay Rum) and Ive been looking at what the British firms are offering, as I enjoy their shaving products their hair product must be at least decent (?). Maybe the T&H pomade, anyone tried that one? Or Trumpers Lime Pomade? I have pretty thick hair so I am looking for something with quite a strong hold and with a medium shine. Speaking of hair products and Truefitt... They have - in collaboration with Morgan Motor Company - redesigned the packagings of their C.A.R. cream and hair lotion, though I don't know if they altered the actual products as well. Olie, I realize you're in Sweden, and shipping may be problematic. In response to your question, Nancy Boy in San Francisco USA makes the best Styling Cream in my personal opinion (Others may disagree. ). I've been through several jars, and am ready to reorder very soon. You may want to browse their website for additional information. I was thinking this morning about Eucris "Hairdressing" (OK, I'm going to kick off on some grammar. "Hairdressing" exists as the present participle of what those who dress hair actually do. As a noun, no. That would need a space to make "Hair" and "Dressing" two separate words. I suppose this arose as they didn't want to call it a "hair oil" - oils being greasy and non-PC, and it is many heavy chains away from being a pomade. Anyway, I digress, and will now shut up.) I'm halfway through my last bottle of the real stuff. The one with oakmoss. The oakmoss that the EU banned. I do have a wretched bottle of post-oakmoss-EU-ruling dreck, and it disappoints. It really disappoints. It's so bad I shall have to find someone I dislike in a furtive manner and give it to them. So, I'm going to make my own. I need mineral oil, which is easy to obtain, and I need a scent. Add in the right proportions to the same bottle and shake when needed. Of the scents I have in larger volumes (obviously not large enough! ), I'm thinking Domenican Bay Rum would go well. Maybe I'll even see the effects shown in The Beano and The Dandy of all those 'hair restorer' cartoons! Thank you Gary, I will check that out! And regarding Eucris.... The new version is that bad, huh? I have heard it was a deterioration and that the new scent was now more in line with Ajaccio Violets, I haven't tried the old version of Eucris hairdressing myself unfortunately and after your post I don't feel so eager to try the new one either. 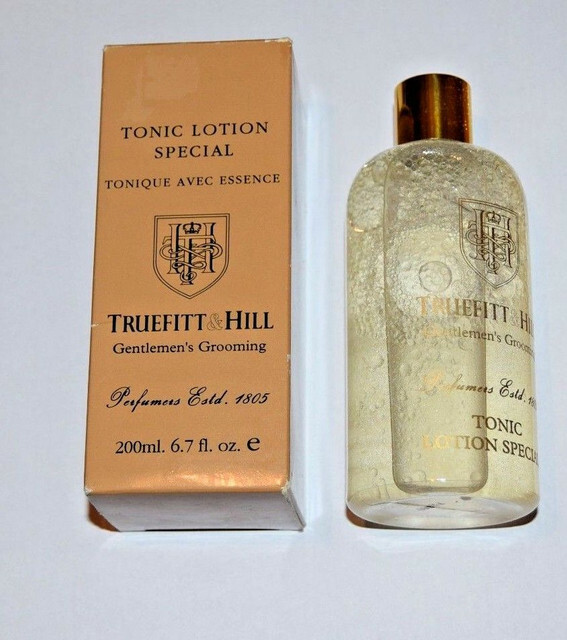 However, I bought a vintage (I think) bottle of Truefitt & Hill Special Hair Lotion on Ebay that has a rather nice zesty citrus scent to it but it doesn't have any hold at all so I have to sort that out with a pomade. Ollie, have you tried Clubman pomade? I don't know if it's available where you are but thought I'd ask. It's good stuff but maybe a bit stiffer than what you're used to. For myself, when I want a hair hold, I've settled on a combination of products: Yardley's Brilliantine and the US Groom & Clean. I combine about 60% G&C with 40% Yardley and mix them together before slicking them through my damp hair. Works a treat to provide shine and hold. It rinses straight out at night before bed. It provides a nice old school slick look if that's what you're looking for. I'm currently using Crown Shaving Company's pomade. It has a clean citrus fragrance that fades quickly, it applies smoothly, and works well for me. (I'm fortunate to have inherited my Dad's and uncles' hair tendencies; they all had thick wavy hair until the days they died.) They ship to numerous countries, but it could be pricey and may take a while, I don't know. No, I haven't checked out the Clubman Pomade but might, I don't think its available in stores in Sweden but I've seen go pretty cheap on the bay,. I think Yardle's brilliantine might be a bit too shiny for myself. I'm gonna put in Truefitt's hair pomade in my next order though. My current tub of Nancy Boy is running on fumes, but that's OK because I just received 2 new ones in yesterday's mail. I'll be set for the next 2 or 3 years now.